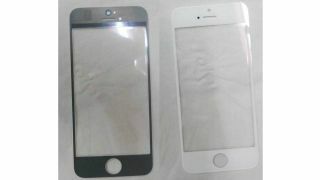 A new photo of what is apparently the iPhone 5 front panel has emerged, showing that the mythical handset will come with a longer screen and in black and white options. Neither of these pieces of information are particularly press-stopping – it's fair to assume that iPhones will come in both black and white forevermore, while every rumour and its dog is posting a longer screen. Aside from that, the pictures show a massive hole for the home button and a repositioned front-mounted camera slot above the earpiece. Unfortunately there isn't much more to be gleaned from the fairly basic image of the fairly basic panels which we're not even convinced are for real on the basis that, well, there's nothing to suggest that they are. After all, the origins are shady - and how difficult would it really be to knock these panels together based on existing rumours? Too easy to even bother trying, we'd say. As spurious as your average Apple leak is, this one's pretty shockingly spurious so we'd file it under 'nah' if we were you. For our money, we like this iPhone 5 rumour – a side-by-side comparison of the "iPhone 5" and the 4S handsets showcasing a largely unchanged design with a larger, longer screen.